This website is maintained with two major aims; to place on record some of the history of the research station at Monks Wood, and to improve contact between its former staff and friends. The 2019 curries will be Saturday June 22 and Saturday November 23. 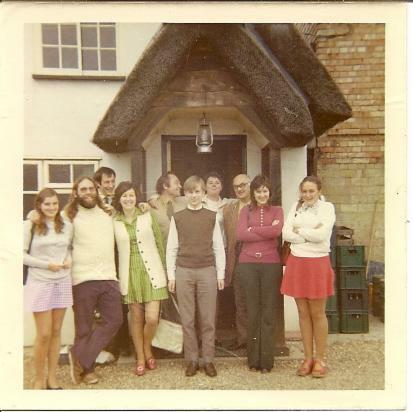 Biological Records Centre (BRC) staff in the early 1970s outside the Royal Oak at Wennington (long-since closed) which we are informed served an excellent mulled wine in the winter. In the 1970s I hate to think what it was made with (Blue Nun? ).From left to right: Christine Allen, Bob Pyle, Geoff Radford, Dianne Scott, Franklyn Perring, David Salmon, Anne Fryer, John Heath, Sharon Dodson and Ruth Marriot. An obituary on Paul Freestone written by Colin Welch is on the staff pages. Monks Wood had a worldwide reputation as an ecological research station, yet was sadly taken away from us on 30 January 2009. The Nature Conservancy was responsible for the birth of Monks Wood; Max Nicholson wanted ‘a new and adequately staffed centre for the effective experimental study, testing, demonstration and dissemination of applied knowledge in animal and plant ecology, and the factors underlying successful management of the fauna and flora’. Eventually a site was chosen immediately to the south of Monks Wood NNR. Some land (appallingly heavy arable land which later defied both drainage and irrigation) was purchased and experiments got underway from 1961. The Nature Conservancy pulled in some of its key staff to work at the new showplace research station. Buildings took a little longer, and early staff were housed in a variety of temporary accommodation and labs between Cambridge and Monks Wood(including Norman Moore’s spare bedroom). In best government accounting practice it was decided to split building costs between two financial years; consequently building work ran into the winter of 1962/3, the coldest since 1739/40, which delayed completion. Further squeezes on funding meant that whilst the conservation research, toxic chemicals and wildlife, and woodlands research units were established the planned vertebrate ecology unit never was. The official opening took place on 28 October 1963 when the station was opened by the Minister for Science, Lord Hailsham. By the time the site was relabelled as The Institute of Terrestrial Ecology in 1973, the research had already gained international reputation; in particular work on pesticide poisoning effects on wildlife, on the value of rapidly disappearing hedgerows, and the establishment of a national Biological Records Centre. Various funding changes led to expansion and contraction over the years, and a refocusing from curiosity-led conservation research to contract-led surveys and experiments. Later merging of research institutes led to a second name change to the Centre for Ecology and Hydrology. A new director gave the impression of a dislike of Monks Wood and its work. Monks Wood was predeceased by its sibling ecology sites in Dorset and Banchory. The death of Monks Wood was long and protracted and in those last three years it is a credit to staff that they maintained a sense of humour and continued with the research that was their passion. Will we ever know exactly why a site with such a good reputation, high research outputs, low running costs, experimental facilities, long-term experiments (some of them over 40 years old), room for expansion and relatively low housing costs was closed? Some 20-30% of staff transferred to other CEH sites; the rest dispersed to the wind. It is unlikely that such a vibrant mix of gifted staff will ever exist again. For those of us that worked there it was a privilege.